HTC announces two new U11 smartphones: Life and Plus | What Hi-Fi? The squeezable phones come with Android Oreo, Bluetooth 5.0 and hi-res audio support. The Life is priced at £350, the Plus comes in at £700. The HTC U11 was an interesting phone - a five-star product, certainly, but stand-out because of its squeezable sides you could map to take pictures, zoom into maps, or...anything, really. (HTC say that, "unlike some people [it is] enabling you to map that to anything, rather than force you to use it for something else" - the company is, perhaps, alluding to Samsung's Bixby button). And now there are two new varieties of the device for those that want a little bit more power, or a little less cost, from the phone: the U11 Life and the U11 Plus. Let's start with the Life. This is the little sibling of the U11, and has a smaller price tag to go along with it - £350 instead of the U11's £650 launch price. What that money gets you is a phone with two 16MP cameras (one on the front and one on the back) and that's capable of 4K video recording. It has a 5.2in 1080p screen with an 16:9 ratio, and a 2600mAh battery. It's also water-resistant to an IP67 rating, in case you want to take some underwater snaps. Powering it is the Android Oreo operating system, and HTC has said this is also an Android One device - which means Google, which recently acquired HTC's smartphone division, has optimised the phone (although HTC are clear it isn't going to discuss the companies' relationship in any great detail). On the sound side, the Life supports Bluetooth 5.0 for wireless audio, 24bit hi-res audio and the company's "USonic" mapping and noise-cancellation tech that maps your inner-ear to tailor the audio to your hearing. This comes at the loss of the headphone jack which, at this point, really isn't unexpected. For a bigger upgrade, there's the U11 Plus. This has a 6in 2880 x 1440 resolution screen with an 18:9 aspect ratio in a bezel-less design, and while it won't come with HDR support at launch HTC says it'll get it by the end of the year. 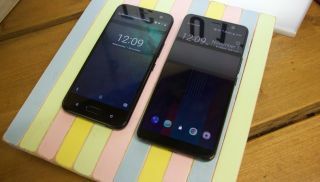 By default, squeezing its sides brings up Google Assistant but, much like the first U11, this phone also comes with Amazon's Alexa voice assistant (as found on the Amazon Echo) as well as the HTC Sense Companion built in. Because if one voice assistant is smart, three must be even smarter! Its Android Oreo OS is powered by a Qualcomm Snapdragon 835 (as opposed to the 630 on the Life) and has a 3930mAh battery that can be charged wirelessly. It comes in two varieties: one with 4GB of RAM and 64GB of storage, one with 6GB of RAM and 128GB of storage (with expandable memory up to 2TB). The camera on its back is 12MP, while the front-facing camera is 8MP with a "selfie panorama" mode that will let you capture more - for those that enjoy large-group selfies. On the sonic side it has the same specs as the Life, but with added support for aptX HD and LDAC (a compression codec used by Sony it claims is more efficient than regular Bluetooth). It also has an "Edge Launcher" which, since this phone is quite large, brings up a menu on the right or left for easy-to-access apps. The U11 Life will be available for pre-order tomorrow, while the U11 Plus will be available on 20th November priced at £700.